Lori Shaw came home to Coalstrip, Mont. from Bozeman. She was in her mid 20s — a prized demographic for rural Rosebud County, and she didn’t know what she wanted to do with herself. She started a pet care business, visiting houses and caring for animals. Within a year, business was booming and the income allowed her to start an activist movement supporting the state’s coal industry and environmentalism. Shaw marketed her business in town on social media. Even more critically, her activism relied on social media to spread messaging statewide. But there was a drawback to life in her town of 2,300, located 30 miles from an interstate. Note: Respondents who did not answer are not shown. It’s a story playing out all over rural America, with the technology available for business, telemedicine, agriculture and ranching all limited by their ability to connect to reliable high-speed internet. The current standard for broadband access is 25 Megabits per second (Mbps) download speed and 3 Mbps upload. “It feels like we’re the redheaded stepchild because we hear about 5G and we don’t even get 3G consistently,” said Doug Martens, a Rosebud County commissioner. It’s a resource allocation problem. Internet service providers have to build the fiber optic lines long distances for relatively few customers and often through difficult terrain. The costs to these businesses often outweigh the benefits, and in Coalstrip’s case, as Martens said, they missed the boat. He added that commissioners had a blind spot for a long time because public buildings like county offices and schools were wired for broadband, while small businesses and residential neighborhoods have not been. WIRE INTERNET CONNECTIONS IN THE U.S.
Internet service over the same connection as cable TV is by far the most popular type of wired internet connection for the U.S. customers, followed by D.S.L (which comes over telephone wires). The Federal Communications Commission (FCC) found that between 2012 and 2016, that level of service was available to 69.3 percent of rural Americans, reaching 43.6 million people from a starting point of 45.7 percent of rural areas and 27.7 million people in 2012. By comparison, 97.9 percent of the urban population, accounting for 254.2 million people, had broadband access in 2016. Seven states had less than 50 percent rural access to broadband in 2016, with Arizona bottoming out at 34.4 percent of the population connected. For entrepreneurs like Shaw in a state like Montana that had 59.2 percent rural broadband, doing business means finding someone with reliable broadband to beg and borrow time in their homes or offices. Coalstrip residents have access to wireless broadband, an unreliable substitute which requires a clear line of sight between the user and the tower on a good day. No trees, no hills, nothing in the way. It’s not a viable substitute, something the FCC has acknowledged. And it may tip the scales for people who would otherwise want to live in small, rural communities, with lower costs of living and quality of life aspects they desire. Atchinson’s organization performed a survey of its client counties and found the most pressing need in this coal-centric region was reliable internet. Rosebud County Commissioner Doug Martens said the need for broadband snuck up on county commissioners because of the unequal access to it. It’s a resource question. The cost to extend fiber lines to small pockets of population are often prohibitive. The U.S. Department of Agriculture’s e-Connectivity Pilot program has allocated $600 million to expand broadband in underserved rural and tribal lands with populations of less than 20,000 residents, though the standard of service targeted through those programs is lower — 10 Mbps download and 1 Mbps upload. Atchinson hopes to cobble together enough sources of funding to build out fiber to Coalstrip, but it’s a chicken and egg proposition. The concern over rural broadband availability isn’t limited to small businesses. 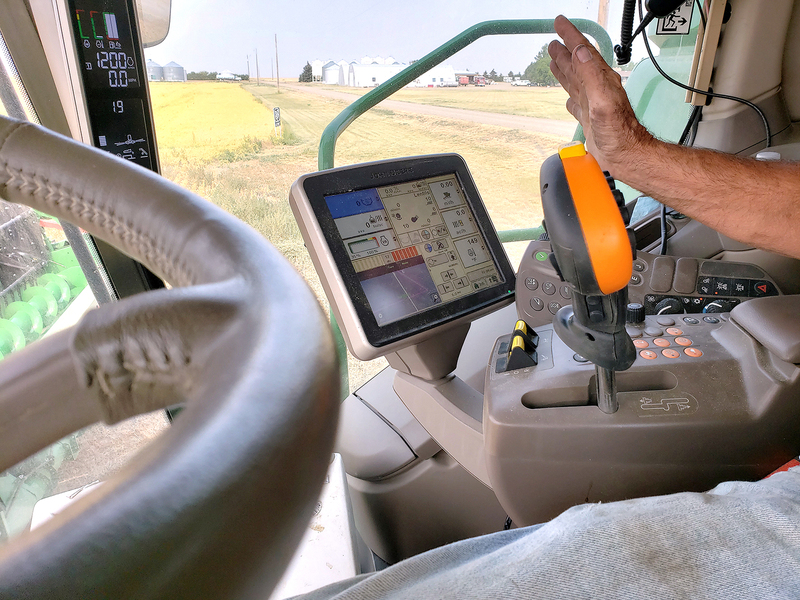 Agricultural work is increasingly dependent on connectivity as technology is added to traditional farm equipment. “I was in a combine the other day and the farmer told me that it has 27 computers running it,” said Shaw, who serves as a member of the Coalstrip City Council. “Half the time when it breaks down, John Deere can fix it remotely,” if the company can read the diagnostic data that needs to be transmitted. Ranching is still all about raising animals, but technology helps. To Clark, the variety of modern needs makes broadband access necessary for the health and future viability of rural communities. “When you look at it from an economic development standpoint, businesses now, that’s what they’re looking for,” he said. “It’s a utility, it’s not a ‘nice thing to have. They’re going to go somewhere they can have reliable speed broadband. For rural counties, broadband internet supports commerce, medicine, agriculture and educational opportunities that even the playing field in attracting and retaining residents and steadying economic health.